Boats proceed into the lock and the boaters hold onto drop cables along the lock wall. The lower gates are cranked shut and the valves in the lower gates are cranked closed (the lock chamber is now watertight). The lock staff move to the upstream end of the lock and slowly open the upper sluice valves. These valves allow water to enter the top of the lock through tunnel sluices. As these valves are opened, water from the upstream side flows into the lock, filling the chamber up to the upstream water level. Note that the sluice valves are opened slowly to prevent excessive turbulence in the lock. As the water depth in the lock chamber increases, the lock staff fully open the valves. When the water in the lock chamber reaches the upstream water level, the upper gates can be cranked open, allowing the boats to leave. The water in the lock chamber is at the same elevation as the upper navigation channel. 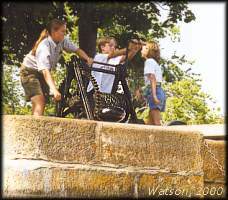 The upper lock gates are cranked open using hand winches, known as “crabs”. The upper gates are closed and the lock staff make sure the upper sluice valves are closed. The lock staff move to the lower gates which have valves built right into them. These valves are slowly opened and water drains from the chamber, lowering the boats to the downstream water level. When the water in the lock chamber reaches the downstream water level, the lower gates can be opened and the boats float out. Some of the locks, such as those at Beveridges, Clowes, Kilmarnock, Narrows and Newboro have gate valves in the upper gates rather than tunnel sluices. Ask the lock staff at these locations why this is.